A lucid narrative spiced with a series of stories told by local experts, historians, and residents, linked with images from a universe of sources, make this fascinating chronology comprehensible to everyone. 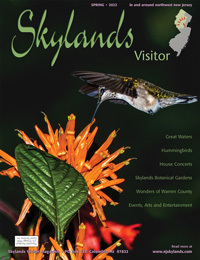 You can enjoy one of the most magnificent tours of heritage and history in the Skylands without leaving your living room. Get yourself a copy of Debra Natyzak's video called Voices of the Land, and you'll be escorted through more than 1 and 1/2 billion years of earth and human history in what is known as the Ridge and Valley region of Sussex and Warren Counties. Frelinghuysen Township, the star of the film and whose Historical Society is the prime sponsor, was set off in 1848 as a Warren County township a few years after Warren and Sussex Counties divided in 1824. Looking on a modern road map, you'll see the Paulinskill River running down the northwest side of Frelinghuysen, a place called Yellow Frame just over it's northeast border with Sussex County, the Jenny Jump State Forest tucked in the township's southern corner, and the tiny hamlet of Johnsonburg at its approximate center. The stage is set with the help of geologist Robert Canace, who stands in front of imposing igneous rock outcroppings in Jenny Jump Forest, estimated to be 1.6 billion years old, some of the oldest rocks on earth. The banding marks on the rocks beside him belie their origins deep beneath the earth's surface. Later lifted by intercontinental collision to form ancient mountain chains 15,000 feet high, this fault is part of a larger ridge and valley geologic province that stretches to Alabama. We learn, with the help of maps, diagrams and splendid photography, how a soluble layer of limestone allowed the formation of the Paulinskill valley, how a glacier's terminus a few miles south meant the birth of Great Meadows and the Pequest River, and how the Delaware River cut through a sandstone ridge to form the Water Gap. This geologic legacy directs much of the story's remainder, the next chapters of which are told by archeologist Glenn Wershing. The valleys scooped out of the earth's surface by the glacial retreat left a fertile area teeming with wildlife; eventually home to the first paleo Indians 12,000 years ago. Mixing the interview with pictures of artifacts, drawings, and present-day views of sites that have yielded thousands of artifacts, the video describes a rich native American culture advancing through the archaic period and finally to the woodland culture of the Lenape. The most remarkable local excavation occurred over a seven year period at a place called Dark Moon. At this ancient arrowhead factory, the Lenape quarried flint from the limestone-rich hills around the site, manufactured thousands of flint points, and buried them for later use. The lodges, huts, pottery and agriculture implements found there with the lode of weaponry are the basis, in part, for the recreated Lenape settlement at Waterloo Village, which appears in the video as illustration for that period. James "Long Bear" Revey, a Lenape-Cherokee Indian, describes native contact with the first European settlers, elucidating the most potent cultural differences between the two populations. Beginning with the first European fur traders in 1654, the inevitable procession west was spurred by copper mining in Pahaquarry, the old mine road from Philadelphia to Kingston, NY, and pioneers like Samuel Green, an English Quaker surveyor who arrived in 1702. Antagonized by the infamous Walking Purchase of 1737, which finally defrauded the Lenni-Lenape of the vital Minisink, the relationship between the two groups rapidly deteriorated to a series of deadly raids throughout Northwest NJ, one of which penetrated to Fredon Township at Hunts Pond. The tale is masterfully told by combining a passionate narrative with potent video, culminating with evocative aerial shots overlaid with the litany of commemorative names: Kittatinny, Allamuchy, Pequanic, Musconetcong, Netcong, Pahaquarry, Hopatcong that remain so familiar. Architectural historian Dennis Bertland recalls the cavalcade of English, Scotch, Irish, Welsh, German and Dutch settlers that inhabited various types of settlements that transformed the wild west of 18th Century New Jersey. Dispersed farmsteads sprang up around the countryside. Groups like the English Quakers in Allamuchy and religious communities like Moravian Hope brought distinctive styles conspicuous to this day. Mills spawned frequent villages, and larger towns grew around iron forges in Oxford, Stanhope, Pequest, Franklin, Hamburg, and Waterloo. The radiant diversity of the area is brilliantly exhibited by a succession of old pictures and current shots of log cabins, Quaker homes and meeting houses, English box frame houses, Georgian homes, lime kilns, mills, manors and forges. And churches! When you follow the map to Yellow Frame, you won't find a village; only a church. From it's pews, Grace Van Horn tells the story of the Yellow Frame Presbyterian Church, standing alone with no town around it through three centuries. Historian Olga Bailey Guiler brings the story closer to home, recounting the days when Johnsonburg, then called Logg Gaol, was the county seat and a crossroads for stage routes from New York to Scranton and Boston to Philadelphia in the mid 1700's. We hear the story of the White Pilgrim, a renowned evangelist who came to town in 1834, preached one sermon, got sick and died from small pox. His gravesite lies in the center of the church cemetery, away from the others for fear of his disease. The narrative begins to run through the more familiar eras of turnpikes, canals and railroads that transformed the land "from a vast wilderness to an exploited land of opportunity". Today's consequent attitudes and frenetic pace seem deficient when Marion Kerr Vitale, a Scotch Presbyterian descendent, speaks of the unity among the old self-sufficient farm families, recalling her childhood as a time of realistic expectations and contentment. Her wistful sentiment becomes much more than a sequence of nostalgia when she suggests that if we cherish a meaningful connection to the place we call home, we'll never lose the sense of belonging that seems so important to us human beings. The connections that are available to Marion are there for everyone who takes the time to look. And that's what this video does; it shows us where and how to look. The film is much more than your local history channel. It connects a tiny town, the rivers and valleys around it, and much of the rest of Northwest New Jersey to timeless and universal origins. Because she has learned to stop and listen, Debra Natyzak's home is historical, mystical and inviting . By communicating love and respect for her lifelong home, Debra's intent is to have us realize why it's so important to preserve our heritage for those who follow us and for those that follow them. Written, directed and produced by Ms. Natyzak, the film is the result of a year-long project. Its a long story; there's alot stuffed into 55 minutes of video. The media's power is well used, nothing is wasted. The production is thoroughly professional, but totally avoids slickness. Besides being a must for area residents, the film has uses for teachers, realtors, local businesses, those considering relocating in the area, and anyone with a casual interest in history. And it makes a very colorful and enticing travelogue; a perfect preview for a visit. The project was supported by a matching grant from the New Jersey Council on the Humanities. The Historical Society hopes to repay the matching portion through sales of the video. Narration beyond the interviews is performed by Drew Lertz, and there is an original musical score by Richard DeRosa. Cameras were handled by Lisa Pachnos, Nick Pachnos and Vic Campbell, whose company, Buzz Creek, distributes the video.